Microsoft Corporation (MSFT) develops, licenses, and supports software products, services, and devices worldwide. The company hiked its quarterly dividend by 7.70% to 42 cents/share. 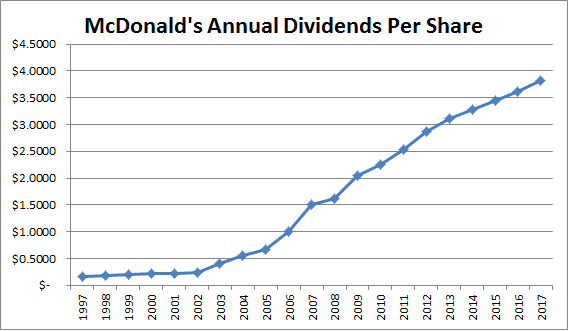 This marked the 16th consecutive annual dividend increase for this dividend achiever. 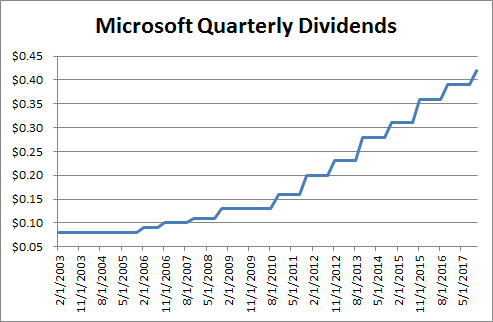 Microsoft has managed to boost dividends at a rate of 14.80%/year over the past decade. This was supported by an increase in earnings from $1.87/share in 2008 to $2.71/share in 2017. The company is expected to earn $3.22/share in 2018. Currently, the stock is overvalued at 23.10 times forward earnings and yields 2.20%. Microsoft would be a better value on dips below $64/share, and an even better one on dips below $54/share. I came up with these values by multiplying the forward earnings for 2018 by 20 and the earnings for 2016 by 20. W. P. Carey Inc. (WPC) is a real estate investment trust that invests in commercial properties that are generally triple-net leased to single corporate tenants including office, warehouse, industrial, logistics, retail, hotel, R&D, and self-storage properties. This Real Estate Investment Trust hiked its quarterly dividend to $1.005/share. This marked the 20th consecutive annual dividend increase for this dividend achiever. It also marked the fourth dividend increase over the past year. W. P. Carey has managed to boost dividends at a rate of 8.10%/year over the past decade. 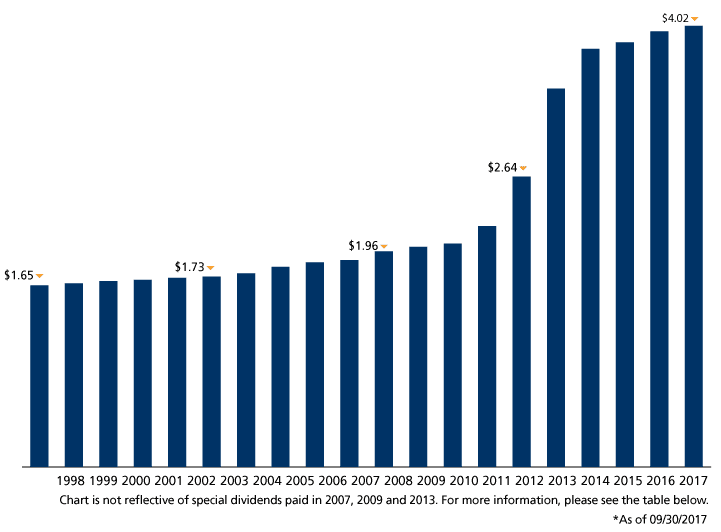 The rate of dividend growth increased after the company converted to REIT status in 2012, and since then has slowed down. 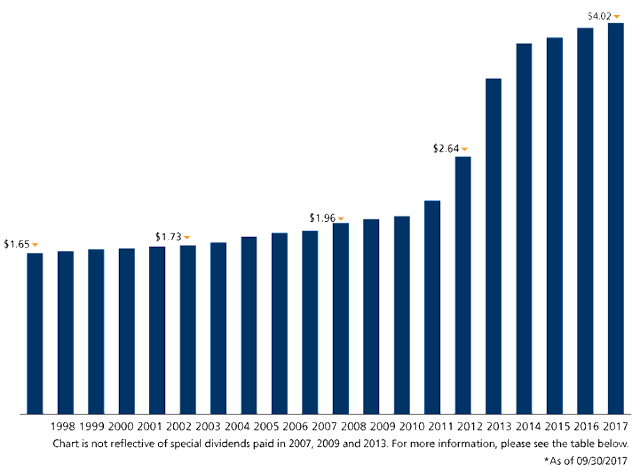 FFO/share increased from $3.34/share in 2007 to $4.86/share in 2016. Currently, the REIT is attractively valued at 14.10 times FFO and yields 5.90%.